Dr. Le received his Ph.D. degree in Microbiology, Immunology and Molecular Genetics (with Owen N. Witte), and a medical degree (M.D.) from the Medical Scientist Training Program at the University of California, Los Angeles (UCLA). He completed an Internship in Internal Medicine at UCLA/St. Mary Medical Center, residency training in Dermatology and a postdoctoral fellowship in Cancer Biology (with Luis F. Parada) from University of Texas Southwestern Medical Center. He is board certified by the American Board of Dermatology. Dr. Le sees patients in the Dermatology clinic and at the UTSW Comprehensive Neurofibromatosis clinic. As a principal investigator in cancer biology, his laboratory investigates how genetic and tumor microenvironmental events interplay to regulate carcinogenesis. His research group focuses on: (1) identifying the cells of origin of tumorigenesis (how do certain type of cancers originate and develop from adult stem/progenitor cells? ); and (2) elucidating the roles of tumor microenvironment in cancer development (how do neighboring non-cancerous cells dictate cancer development and progression?). His laboratory dissects these cellular and molecular mechanisms of tumorigenesis from the developmental perspective. They utilize Neurofibromatosis Type 1 (NF1), a common tumor predisposition human genetic disorder, as a model to address these two fundamental questions in cancer biology as well as elucidating cutaneous nervous system development and regeneration. 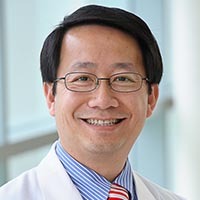 His major research goals are to understand mechanisms that initiate Neurofibroma genesis and drive their malignant transformation as well as to develop novel therapeutic targets for Neurofibroma. Research in Dr. Le's laboratory is supported by grants from the National Cancer Institute of the National Institutes of Health as well as grants from the U.S. Department of Defense and the Burroughs Wellcome Fund. Cell of origin and microenvironment contribution for NF1-associated dermal neurofibromas. Chen, Z., Pradhan, S., Liu, C. and Le, L.Q. Stem Cells 2012 30 (10) 2261-2270. Liao, C.P., Booker, R.C., Morrison, S.J., Le, L.Q. Genes & Development 2017 31(8): 744-756. Liao, C.P., Tchegnon, E., Le, L.Q. Journal of Investigative Dermatology. 2019 139(1): 17-19. Spatiotemporal loss of NF1 in Schwann cell lineage leads to different types of cutaneous neurofibroma susceptible to modification by the Hippo pathway. Chen, Z., Mo, J., Brosseau, J.P., Shipman, T., Wang, Y., Liao, C.P., Cooper, J.M., Allaway, R.J., Gosline, S., Guinney, J., Carroll, T., Le, L.Q. Cancer Discovery. 2019 9(1): 114-129. Allaway, R., Gosline, S., Knight, P., Guinney, J., La Rosa, S., Bakker, A., Le, L.Q. British Journal of Cancer. 2018 118(12): 1539-1648. Blakeley J.O., Wolkenstein P., Widemann, B.C., Lee, J., Le L.Q., Jackson, R., Stathis, M., Verma S. Neurology 2018 91(2): S1-S4.